I’ve been spending more and more time recently playing my rogue. It turns out that sneaking around, picking pockets and killing healers is my cup of tea after all. 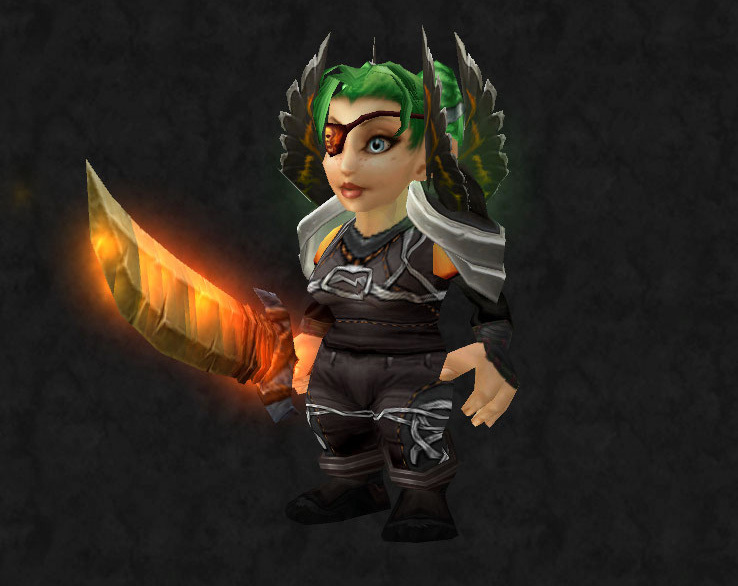 I wanted an outfit which screamed ROGUE but without being too over the top. I knew it had to be mostly dark colours but with an accent of something brighter. The starting point for this was actually a comment Navimie made about my “crow fetish”. 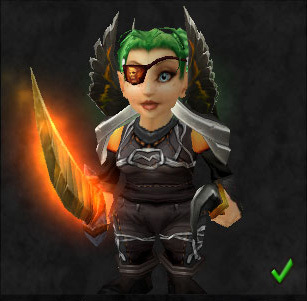 From birds through the Antivan Crows I ended up at Ravenwing Pauldrons and thought, “hmm, bet they look good on gnomes!”. Head: Warp-Raider’s Eyepatch (From this quest in Netherstorm). Chest: Cadaverous Armor (Both this and the legs have a low chance to drop in Scholomance off the six mini bosses before Gandling). Boots: Chop Chop Boots (These are a quest reward in Winterspring but any plain dark coloured boots would do). Off Hand: Unkeeper Blade (Quest reward from the Hinterlands). This is my wishlist for MoP, focusing on all the important stuff like pets, mounts and romances between NPCS. A raven, quothing “Nevermore” is optional. My Worgen Shadowpriest would call him “Edgar” and take him everywhere. An octopus. 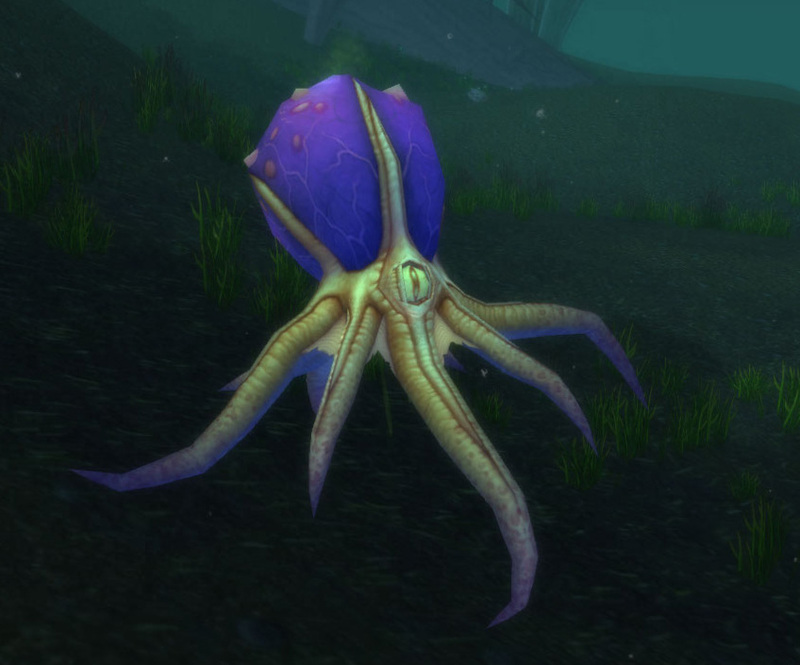 Like the sea pony and the fish, it might have to be in a giant bubble but these models are too good to be hiding in Vash’jir and off the coast of Darnassus. A floating alchemy lab that causes minor fireworks and explosives every so often. It would also let you make all the old bits and pieces which still require the presence of an alchemy lab where ever you are. The odd leak could turn passing critters into multi coloured enlarged versions of themselves before going pop. A scorpion. Well why not, they already exist as critters so why can’t we have them as pets, would work well with the Horde guild mount. A flying mechostrider made for two. 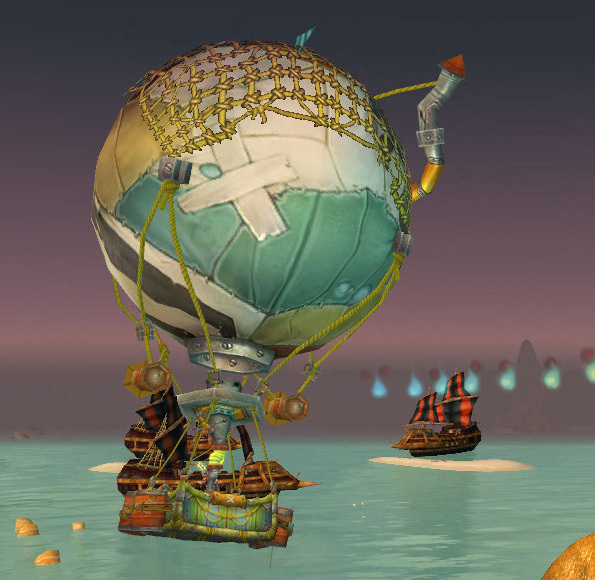 Perhaps made by Gnomish engineers, Goblins could build a trike with wings or something similar. A hot air balloon. It’s clearly handmade so would be a perfect addition to a profession, perhaps even a collaboration between Engineering and Leatherworking. Boats. 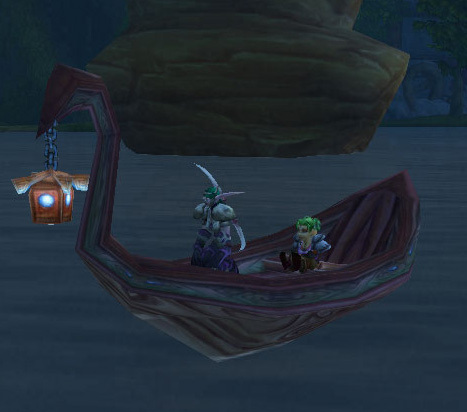 There are so many models floating about and yet we can’t have a proper fishing boat. 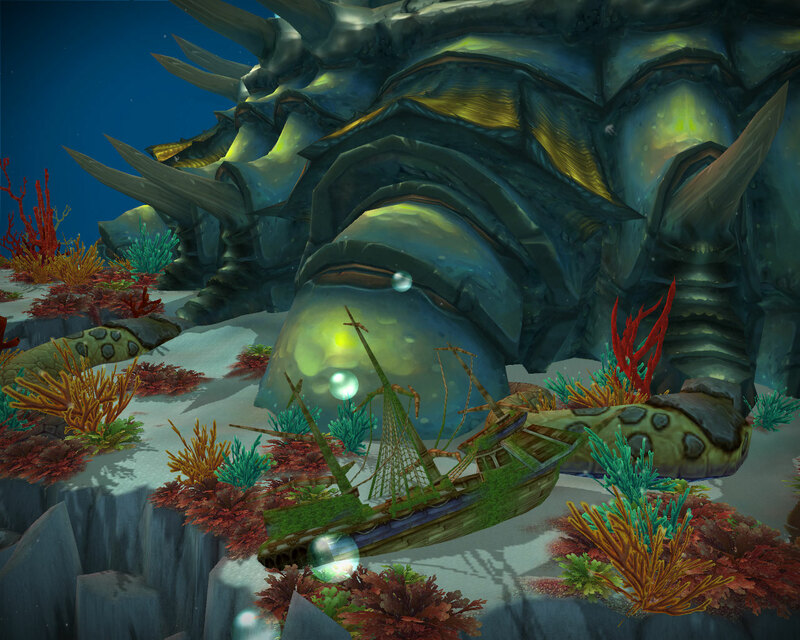 They teased us in the Thousand Needles with a steamboat so surely it’s time to give us an all purpose seafaring vessel. One you can park next to the off-shore fishing pools and break out a cold beer whilst chatting with friends. Minx. 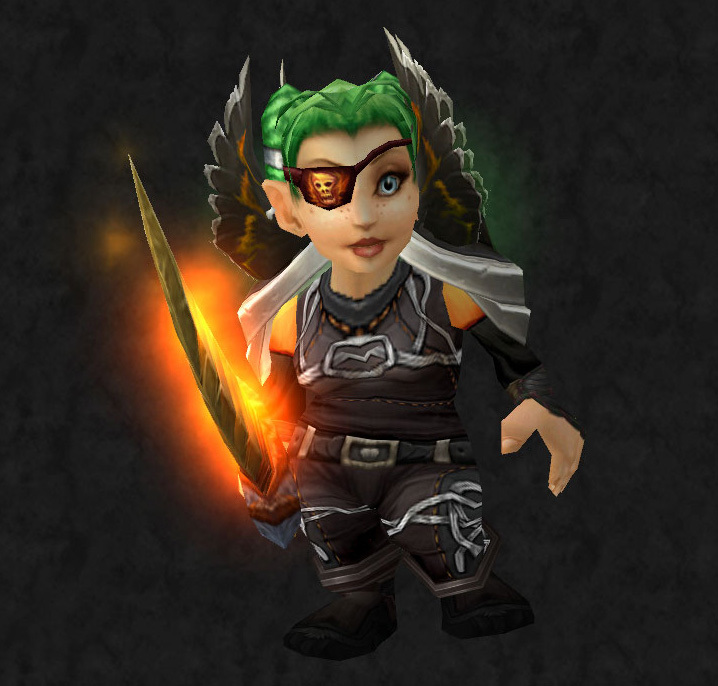 She speaks fluent Orcish and is clearly a master of disguise plus she’s a green haired gnome (the best kind). She definitely needs to make an appearance somewhere on the battlefield. Thassarian and Koltira. Cliffhangers are fine as long as we find out what happened to them soon. Thisalee Crow. Anyone who can do this to a Harpy is clearly awesome and needs more storylines. If we can’t have her, I’d settle for her shoulders. Transmogrification Tuesday – Green grow the rushes oh! This is my Undead Priest, Dornröschen. One of her most prized possessions is her Arathi basin tabard so I thought I’d base her outfit around it. 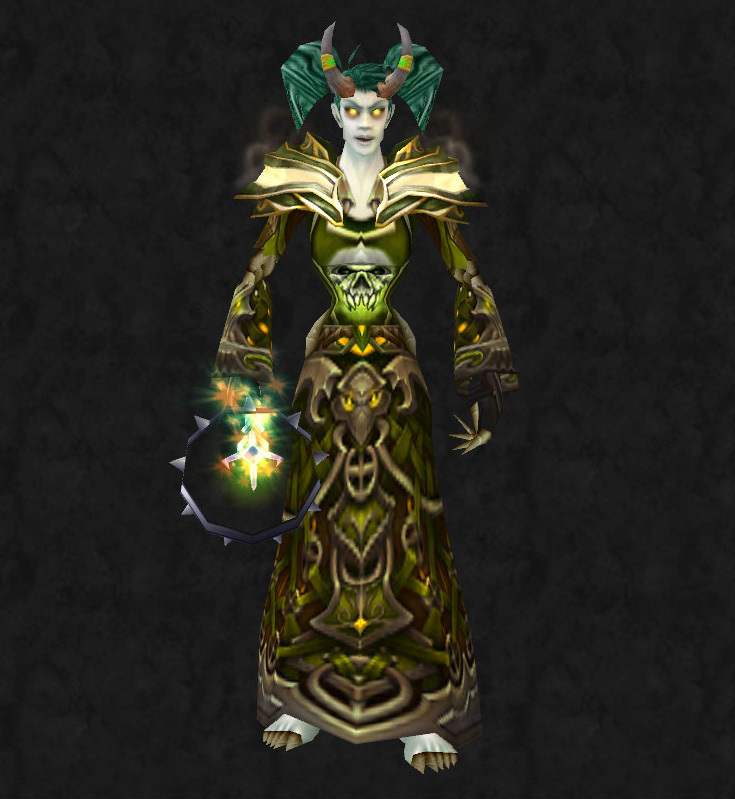 The shoulders are Priest only and the helm is Horde only unless you are a Warlock so it’s a fairly specific ensemble but then since the Alliance don’t get a green tabard I suppose it doesn’t matter. I know the shades of green aren’t identical but I prefer the detail on this robe as opposed to the one which matches the shoulders. 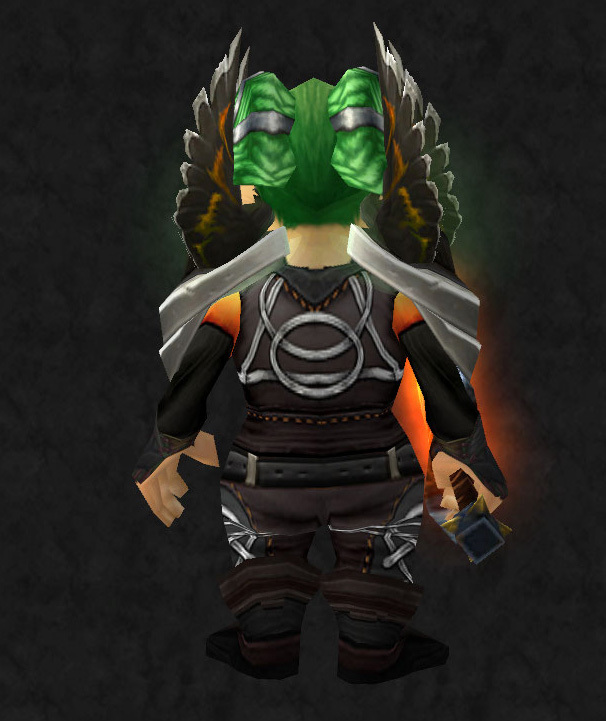 The fanged face on the tabard is almost mirrored by one on the skirt. For the hands, wrists and feet any dark coloured plain gloves and boots will do. I went with the Staff of Hale Magefire because it’s the staff that all my Priests started out with and as such has lots of memories. 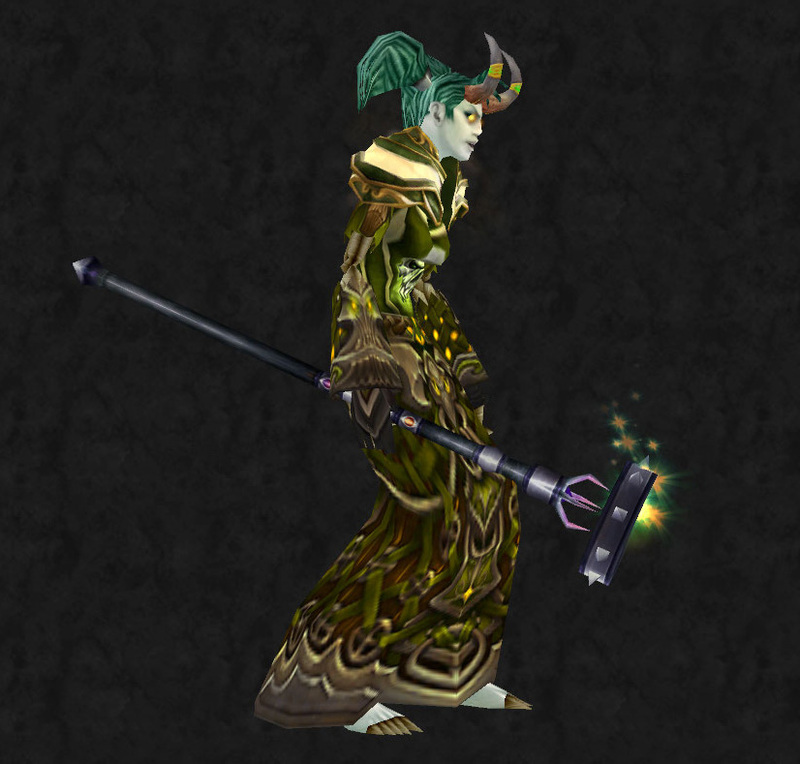 The baleful flames on it go with the yellowy green hints on the shoulders, tabard and robe too. This is Day 6 of Serenity Saz’s screenshot challenge. Most of us have a favorite poet or song. Give us an image that you think represents your favorite line, or what line inspires you most. You should probably include said line and *maybe* give some explanation/reasoning behind it, unless you’re feeling overly ambiguous. From Diving into the Wreck by Adrienne Rich. I read Literature at University and was introduced to Adrienne Rich’s writing through one of my honour courses. She had me from the first line I read. I’m not going to talk about why I love this poem so much as I’d rather people drew their own conclusions, especially if this is the first time they’ve read it. Then because I’ve always loved poetry, I thought I’d throw in a second one for luck. I can’t help thinking this sums up Sylvanas perfectly. Like Dolores, she is “fresh from the kisses of death;” and a gross corruption of the “Sacred Mother” figure. Given her colouring and fondness for poison gas, the last two lines quoted here could have been written for the Banshee Queen. This poem also has a soft spot in my heart because whilst I was a student, reading it aloud whilst slightly intoxicated netted more than one date. Possibly they would have asked me out anyway, but I like to think Swinburne made them do it. I woke up this morning to discover I’d been tagged by Windsoar in a screenshot meme originally created by Gnomeaggedon. My first thought went something like this “Screenshots yay!” but then I read the small print. Open the sixth sub-folder. If you have such a thing, I just have various screenshot folders left over from every attempt I’ve ever made to quit the game. (Well deleting WoW is one thing, deleting years of screenshots another entirely) and choose the sixth image. Post the image along with a few words about why it happens to be in your screenshot folder. Find six other bloggers, invite them to play and link to them. After making a few whimpering noises and whilst praying the dice wouldn’t land on some of the more suspect conversions I may have screenshotted for amusement and the potential bribery of a raidleader or two, I plucked up the courage to have a look. Because I have more than one but less than six screenshot folders, I picked one at random with my eyes shut. On opening them and checking out the sixth image this is what confronted me. A picture of my second favourite Nightelf in-game. 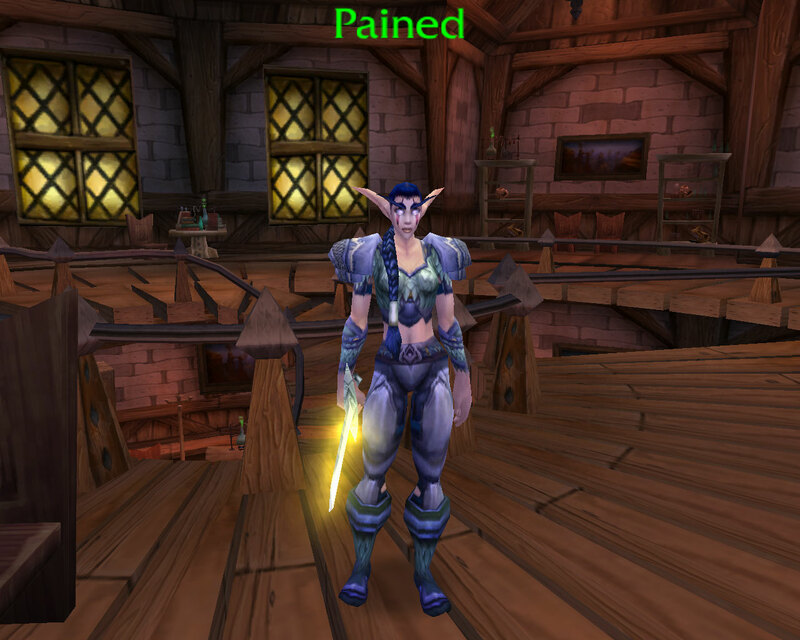 From her name, to her shiny bruise blue armour to the fact that she’s obviously consoling Jaina in some (hopefully horizontal) fashion, I’ve been a fan ever since I first hit Theramore on my very first character. Ok, so now that’s the dubious insight into my character over and done with, here comes the hard part – finding six other people that haven’t already been tagged. This was slightly problematic since the first names which came to mind had already been lasso’d by those sneaky American and Australian types who posted whilst I was sleeping as well as by any Europeans who got up earlier than me (which this morning was probably everyone!). However after a few minutes spent with my feedreader and the assumption that everyone who plays has a screenshot folder, here are my six. 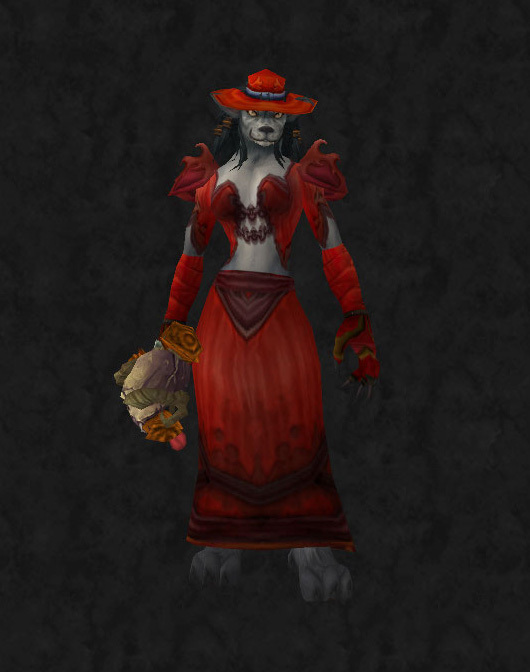 Given that Valentine’s Day is upon us, it seems totally inappropriate that today’s outfit is brought to you by “Miss” Havisham the Worgen Shadowpriest. However, here she is, in her “heartbreaker” set. As Estella didn’t make it out of Gilneas, Havisham has to do all the heart breaking herself (just can’t get the staff these days!). Red to complement her frozen heart with just a bit of fur on display, after all you can’t expect to snare victims in an ancient wedding dress. The staff litters her path with rose petals, perfect for romantic picnics and to the wise, the skull might give an indication of her intent. Of course any blood that might arise from the heart breaking process doesn’t show so it’s both practical and pretty. Wrists: Earthmender’s Bracers of Shattering (Quest reward from Shadowmoon Valley). Hands: Gloves of the High Magus (Quest reward from Shadowmoon Valley). 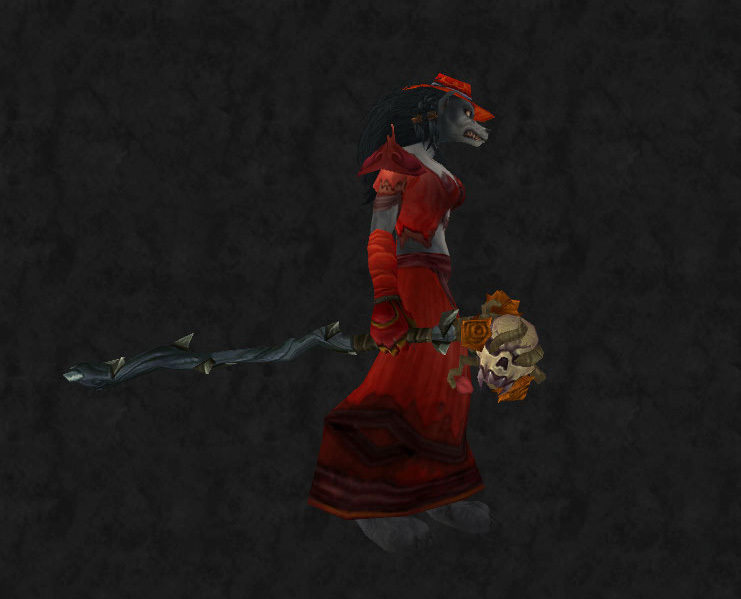 Weapon: Staff of Earned Tranquillity (Worgen only), other options would be Twisted Visage (Ulduar), Damnation (Naxxamas) or the Bloodfire Greatstaff (the Black Morass). If you prefer off-hand/main combinations, the Dungeoneering guide (made by inscriptions) or the Orb of the Forgotten Seer (Scarlet Monastery) would also work, especially when teamed with a plain dagger. We are going to be testing out account wide features with Pet Battles that are coming with the introduction of Mists of Pandaria. If this proves to be successful, then we may even consider doing the same thing with mounts. With Mists of Pandaria, account-wide achievements will indeed become available at the Battle.net account level, and many achievements will be shared among characters. A wide array of achievements will certainly be covered, including achievements that relate to everything from raiding and PvP to maxing out professions and assorted fun challenges. While we’re still working out many of the details regarding account-wide achievement functionality, I want to clarify that we plan for the system to apply to all achievements — not just those added in Mists of Pandaria. It’s intended to be an overall change to the current achievement system.Our goal is to make it so that you feel like you only have to get an achievement once. We think the time and effort you put into achievements should be evident regardless of which character you’re playing. The update will be implemented at the Battle.net level and, as such, would apply to all of the attached World of Warcraft licenses on the account. I want everyone to be a bit cautious about their expectations as of yet. We still have a lot of details to work out in regard to how this will all work. Once we have more specific information to share on it, we’ll let you all know. I don’t want anyone to get too far ahead on things until we can share more and explain any possible “ifs”, “ands”, and “buts” with you all should there be any put in place. It sounds as if we’re going to have to change our mindsets when it comes to achievements. Instead of being something you collect on a character by character basis, it could well be account bound by the time MoP comes out. I have to admit I’m torn on the topic. On the one hand, my raiding achievements are spread across three characters as I swapped mains during the Burning Crusade to help my guild with our sudden Resto Shaman shortage during the Sunwell period. Having account-wide achievements would certainly help with that. Instead of having to refer a prospective guild to say four different armory profiles to back up your application, one character would show everything you have achieved in-game. It would make switching characters both for personal reasons and for raid balance/to help your guild out far more attractive too. It also makes sense as it’s us, the people behind the keyboard who complete the achievements and having then account-wide would reflect that. I (the player) put in the time and effort to get the Hand of A’dal achievement, to farm rank 12, to kill Yogg-Saron and all the other bits and pieces I’ve done over the years, so why shouldn’t all my characters show what I’ve done. As it currently stands, the character I’m currently playing the most was created in September 2011 and has achieved very little. Anyone looking at her in a vacuum has no idea that I’ve played for almost seven years or that I’ve killed X on hardmode or Y when it was current content. So, yes, I would benefit from these prospective changes. However (and you knew the but was coming didn’t you), I’m surprised at this comment in particular. Doesn’t that shrink the game some what. Think of all the repeatable content which suddenly becomes irrelevant. You complete the Explorer once and you never have to do it again. 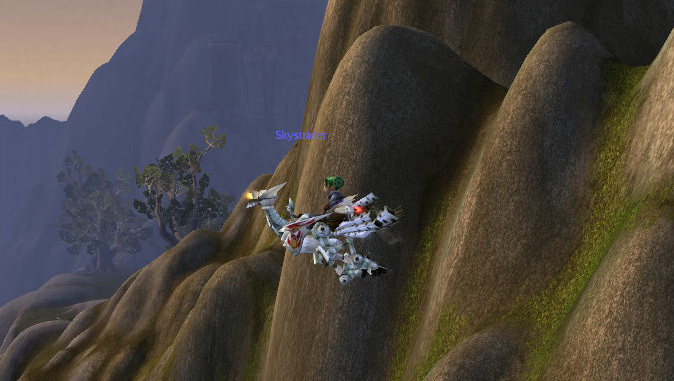 Done Loremaster, great, now you don’t need to visit Stonetalon Mountains on another character ever again. What about titles/pets and mounts from achievements? Take farming Anzu for example, it’s not crucial and yes it can be annoying when it doesn’t drop on the 100th run but that still doesn’t mean it should be on all your characters just because you did it once. However, having the achievement without the reward (in the shape of titles/mounts/pets/tabards) surely flies in the face of “only have to get an achievement once” because without the reward, people will still want to get the achievement on more than one character. So that suggests that a lot of the rewards have to become account-wide too otherwise it’s a pointless exercise. I think this is the bit that bugs me the most. It would seem wrong to me in a game which is fundamentally about levelling and becoming stronger as you do so, that whenever you make a character, you receive a sackful of goodies, titles and achievements in the mail. I realise the answer to the shrinking content is simple, just add more and making achievements account-wide does give Blizzard plenty of scope for that. Instead of getting 250 000 hks for example, add an achievement for for 500 000 and then 1 million across your account and so on. I also wonder how professions would work, does this mean that I never would have to level archaeology on another character ever again or that we might be seeing super awesome rewards for levelling it on multiple characters (please please please be the former!). I also get that one account sharing all it’s pets is probably crucial to the success of the pet battle system. I mean if I put hours of work into levelling Pyewacket the Feline Familiar or Serenity the Firefly on one character, I wouldn’t want to waste time levelling that same pet with the same abilities on another character. However, I have to admit, I’m not too keen on it. What happens to the pets you have multiple times across your account? Take the little white kitten for example, I have several across my account and each one has a different story behind it. Some my husband’s alts purchased for particular characters as gifts, others I bought myself, racing other players to Lil Timmy and one I grabbed off the AH. Will those seven or eight little kittens just become one? If so, why waste time farming multiple pets of the same type on different characters. 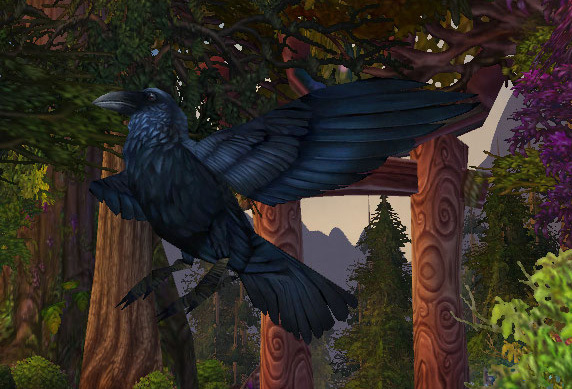 Take this years Lunar Festival, imagine farming multiple lanterns or spending massive amounts of gold to get one for each character and then discovering a few weeks down the line, hey, we’re making pets account bound, you only needed one… Yes, it means that my Hyacinth Macaw might finally get some action but I still find myself a little unhappy at the idea. I suppose what I envisioned when account-wide achievements first came up, seems completely different to what Blizzard envisioned. I imagined we’d get an extra tab on your achievement page, that would fit in between your “personal”, i.e. character achievements and the guild ones. An account wide list of everything you the player has achieved over your years of playing WoW, that regardless of which character you’re currently logged on, you can link or people can look at. By the sound of it, however, if things go according to plan, we might just have one achievement page which shows everything your characters have done. I thought at most, the Feats of Strength might be shared across your account but not much more. Take logging in on the game’s Xth anniversary, which character/s you did it on probably isn’t that important in the scale of things. However, on closer inspection of my Feats of Strength I have mixed feelings about even them. Should all my characters be “wielders of Val’anyr” or have access to my classic PvP ranks. I hit rank 12 once and rank 8 on another three characters which is enough to allow me to transmogrify the classic PvP sets on four characters. Being able to use them on all my characters would be awesome but then I don’t believe the restriction should exist in the first place. I’d rather Blizzard just did away with that restrictive rule rather than gave all my characters access to things which they didn’t earn. I know that sounds silly because “I” earned them and it shouldn’t matter which character I’m playing but to me at least it does. Then there is the stalking potential and no I’m not paranoid. I’m actually one of those strange people who posts on Blizzard’s forums with their main character not a lv 10 or under. Anyone I’m arguing with is welcome to call me a scrub or worse (oddly enough people seem to end up apologising/playing nice, I’m clearly doing the whole PvP forum thing totally wrong). Your achievements across your account will end up like a unique fingerprint, especially when we take dates and Feats of Strength into account. I’m sure it wouldn’t take long for some enterprising person to come up with a website and a program for parsing armory data and linking all characters with that unique fingerprint together. Suddenly hiding on the forums would get a lot harder, as would server transferring/renaming. I know that’s not necessarily a bad thing but some people do get hounded unfairly and this would make checking up/stalking people a lot simpler. Yes, none of this is written in stone. It’s just idle speculation on my part based on a few comments made by people with their names in pretty blue text. 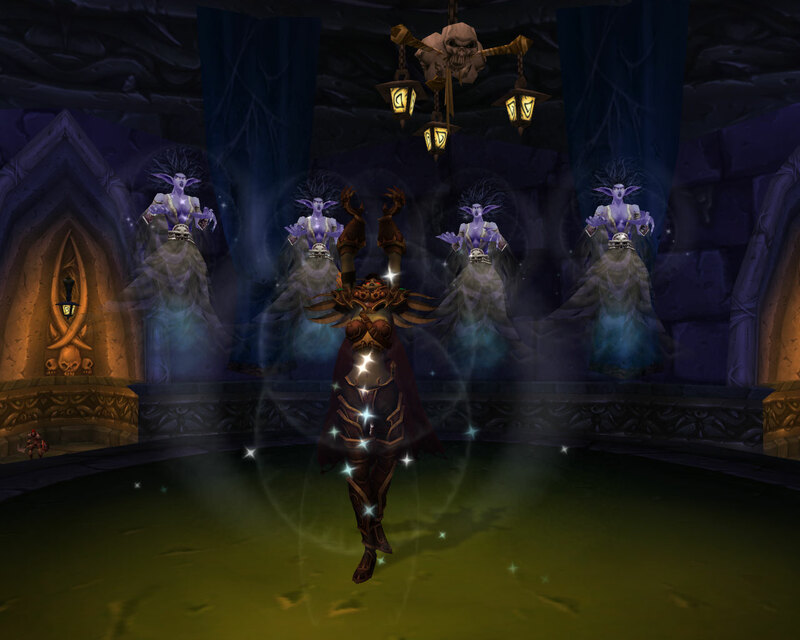 Regardless though of what the achievement system does end up looking like in MoP, I suspect a sea change is on the way. 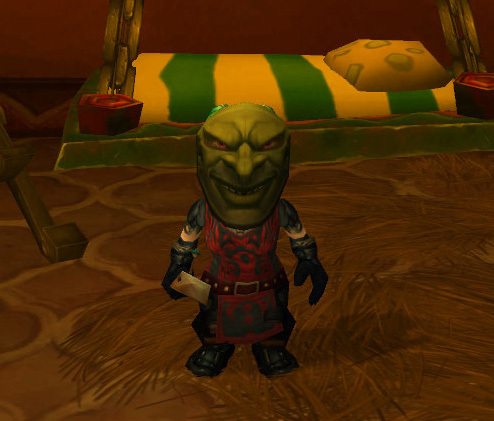 Achievements look as if they are becoming a record of how we the players spend our time in Azeroth as opposed to how we spend our time playing each individual character on our account. The next few months are going to be interesting.